Mercedes tests the G-Class’s ability to handle some intriguing terrain. 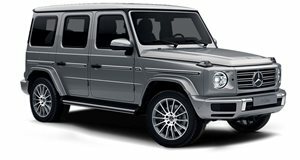 The Mercedes-Benz G-Class is one impressive luxury off-roader. The new G-Class has been put through its paces by Mercedes and to prove the ruggedness of their latest G-Wagon, they took it to the &apos;Iron-Schockl&apos; for a wicked test drive. The near-vertical incline and decline of the Iron-Shockl is more than enough to make one second guess his decisions in life. At the top of the German company&apos;s maniacal &apos;hill&apos; there is a hydraulically steered seesaw which tilts forward towards the decline portion of the test. The devious Iron-Shockl is located in Sindelfingen, Germany, at Mercedes&apos; G-Class Driving Experience. The center drew over 280 participants from more than 130 countries.